For Christmas I decided to make something unhealthy for an appetizer. I decided not to really celebrate this year, but just spend the afternoon with friends eating tasty food and drinking lovely wine. I love dishes you can make ahead of time, they make life so much easier on the "big" day and who can resist a recipe titled: Chicken Faux Gras. This recipe is from Gourmet's Diary of a Foodie from the Contraband Cuisine episode. The recipe for the mousse is pretty simple and just requires: onion, butter, garlic, heavy cream, chicken livers, sea salt, black pepper. It also has a parsley gelee for the top of the mousse and requires: a cucumber, gelatin, lemon juice, suger, Tabasco sauce, flat-leaf parsley (which I omitted due to my hosts dislike of parsley, thus making it really a cucumber gelee). The whole recipe can be found on the Gourmet site here. While we were devouring the mousse / pate (it really is delicious), I noted that I could do without the gelee on top and my host noted that it really provided a nice balance to the mousse - which I can agree with. Incidentally, we enjoyed the Faux Gras with a bottle of Francois Cazin 2004 Cour-Cheverny Cuvee Renaissance which is an off-dry, but lovely balanced, Romorantin from the Loire Valley. It matched perfectly with the mousse. It is available for about $18 to $20. In lieu of my usual house scotch, the Black Bottle (see earlier post), I had to recently purchase another scotch and tried the Old Pulteney 12 Year. This is a completely different animal to the Black Bottle - the Black Bottle is an Islay blend and the Old Pulteney 12 Year is a Highland single malt. Where the Black Bottle is smoky, peaty, with a touch of iodine on the nose, the Old Pulteney is fresher, floral, richer, salty. It is matured in air-dried old bourbon casks. 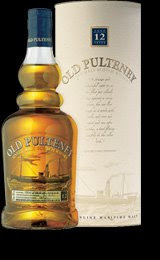 Old Pulteney is supposedly the most northern distillary in Scotland based in the town of Wick. I am a Islay fan, so I am not going to change my house scotch, especially since the Black Bottle is so inexpensive at about $24.99, but the Old Pulteney 12 Year is definitely worth a try for something a little different. And at about $40.99, it is still not in the pricey range of some single malts.